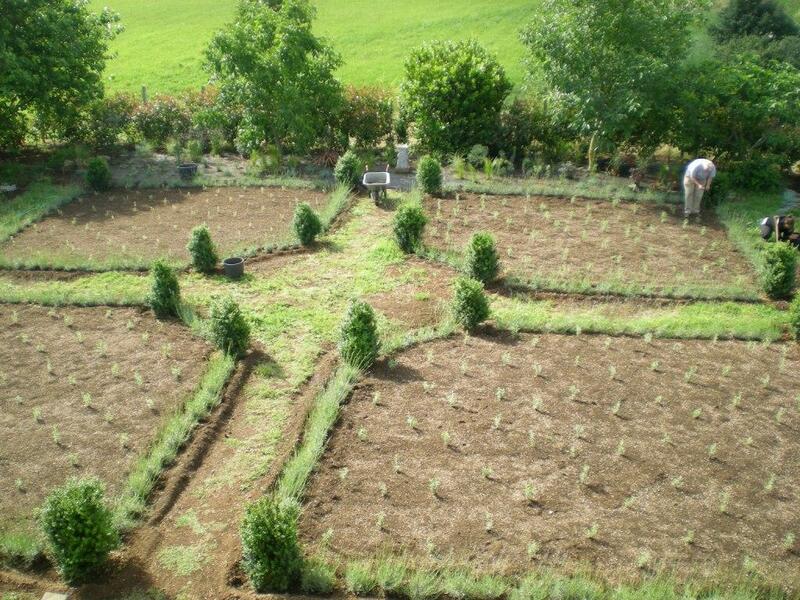 There are four identical beds edged with lavender with Box cubes at the corners, they are planted with Perovskia. 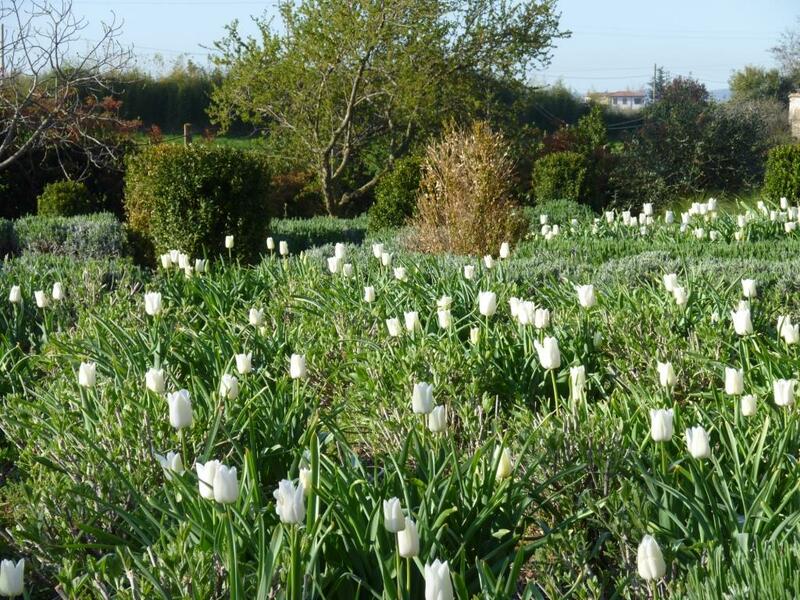 The front 2 beds are under-planted with Tulipa White Dream and Allium. There is no summer irrigation. 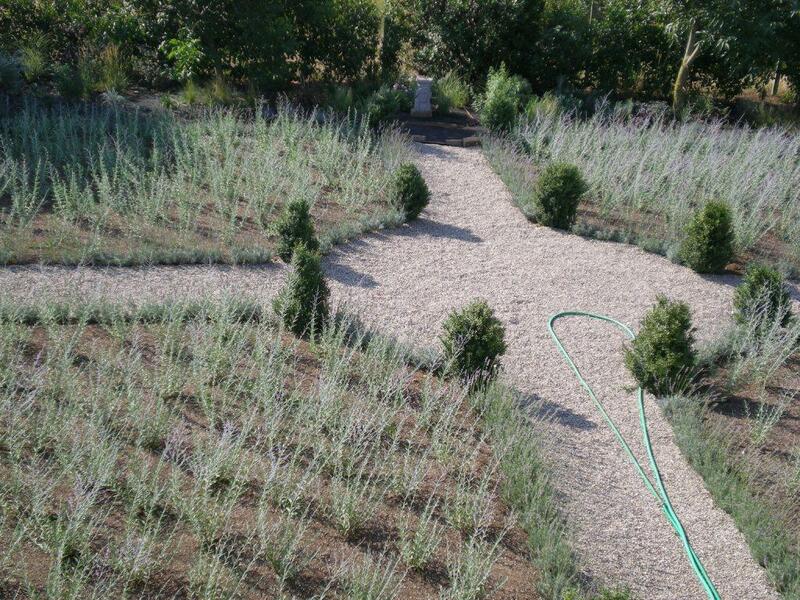 By the end of July we’d added gravel and look how the Perovskia have grown! In September the lavender was cut back (this is too late). 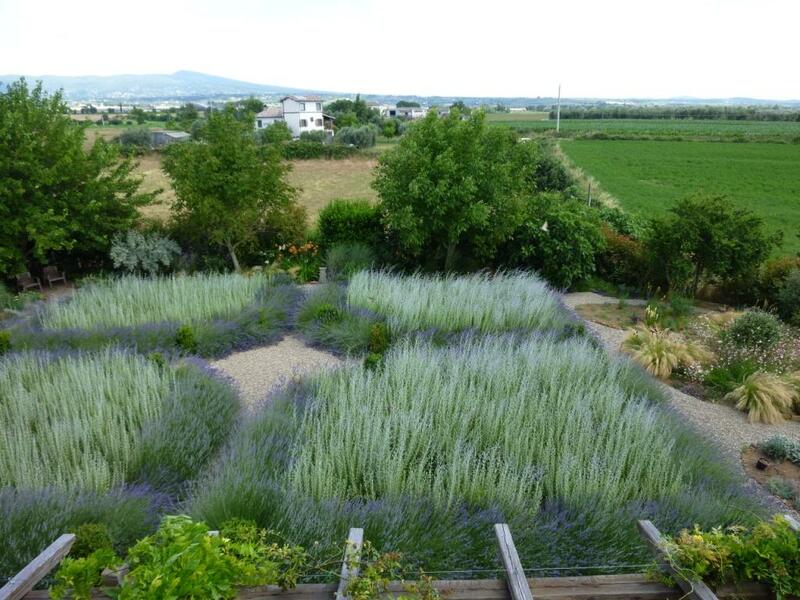 The lavender grows so much I am considering changing it to box or myrtle. 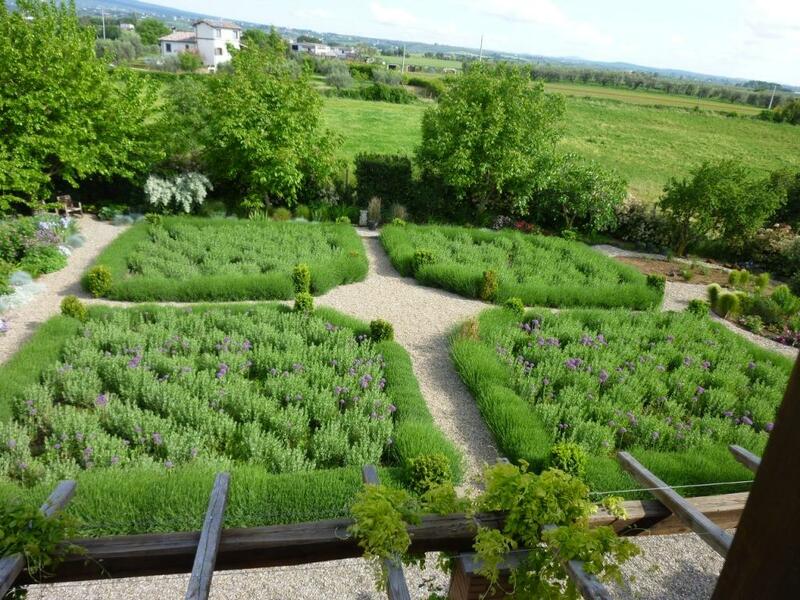 Also as I grow older I love the formality of the pruned lavender almost more than when its flowering, though of course I do love the bees and butterflies that are attracted to it, not to mention the wonderful perfume. This is simply stunning! The softness of the lavender and russian sage together remind me of a Monet…love it! Thank you Brenda, what a compliment. Beautiful! 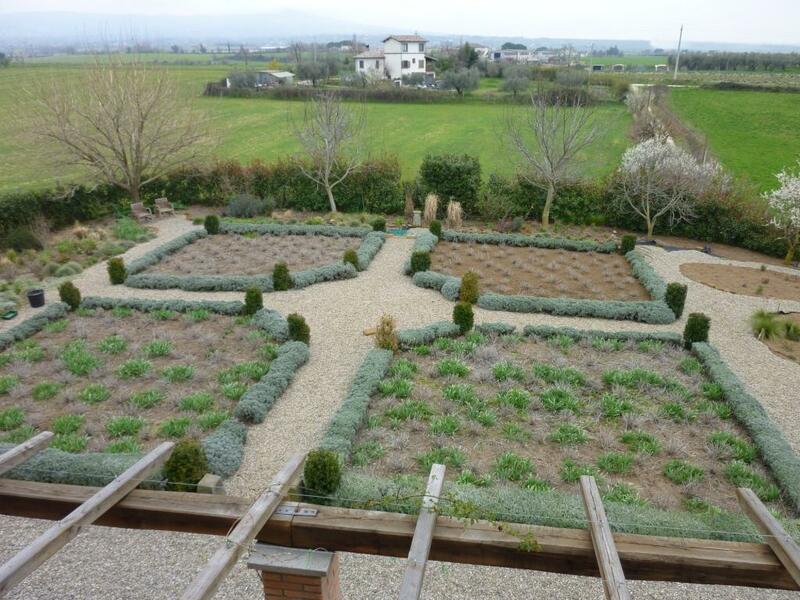 I’d love a formal garden like that, our landscape includes many steep slopes, so I need to figure that out first. Incredible – wow just incredible. Beautiful planning and execution! So beautiful! My favorite is actually May when it is almost entirely green – it looks like a giant soft pincushion! What a masterpiece. Absolutely delightful, Christina. It’s nice and encouraging to record its development. I have decided to use a wide angle including the formal beds for the new meme by xericstyle. WHOA! that’s a crazy mission!! SO fun to see the progress over time! BEAUTIFUL! Grazie Simonetta e benvenuto a My Hesperides Garden. Parlo meglio che scrivo. Abito in Italia da 2003, sono molto fortunato avere molte care amiche, anche loro appassionate di giardinaggio. Hi Christina, the scent from the formal garden must be divine on a hot Summers day. Have you got a 2015 image to update this? Today’s post deals with the redesigned formal garden Doris, you might want to look back at all the redesign posts to help you visualize the garden as it is now. Oh I have just read that and missed the fact that it is in the same area! sorry. Don’t worry it is always hard to visualize a garden from one post. I was trying not to call it the formal garden any more because that’s not what it is any more. All change in the formal garden! I love the layout you posted, almost ecclesiastical. Tremendous achievement both in the planting and preparation. You must be rather excited to see it all grow. Keep us posted,as they say. I will do! Your comment is a timely reminder that I should update this section so thank you! I love seeing the change of the seasons! How beautiful. The formal garden has changed dramatically now. You’ve reminded me I need to update this part of the blog. Thanks for following.